The activity of our sun (the cause of aurorae here on Earth) ebbs and flows in eleven year cycles. The peak of the current solar cycle - an apex of auroral activity - will occur around 2013. Revolutionary improvements in imaging technology have been made since the last solar cycle. We have progressed from film to an age of digital image sensors which offer far greater sensitivity and resolution, along with real time feedback and less noise. Our ability to predict the timing and intensity of aurorae has been enhanced considerably with the launch of the Solar & Heliospheric Observatory, the product of a collaboration between the European Space Agency and NASA. In the next few years we will enjoy sensational aurorae, advance notice of their arrival, and the equipment necessary to capture them as never before. Even armed with all of these advantages, however, the aurorae are not going to put themselves on your memory cards. That's something you'll have to do yourself, and it can be a struggle. This article provides ten suggestions that, if followed, will improve your odds of emerging from that struggle with some exceptional imagery. This article consists of two pages - the first page deals with how to find an aurora and equip yourself to capture it properly, and page 2 will guide you through the remainder of the process, including camera settings, composition and advanced topics. Let’s begin by getting to know the aurora. According to my friend, astrophysicist Dr. Henry Throop, the aurora was thought at one time to be caused by ices suspended high above the Earth’s coldest, darkest regions. We now know that the aurora is actually an electrical phenomenon, caused by interactions between the solar wind and the Earth’s upper atmosphere. The sun emits massless photons that we see as light, but also emits out a real, physical, tangible wind of particles which moves at several hundred kilometers per second. When this wind reaches the Earth, it begins a process that ends by exciting gasses in the Earth’s atmosphere, eventually leading to the emission of light. And just as a true neon light only comes in one color (red), the colors of the aurora are limited too: green and red caused by oxygen, with the fainter blue and purple caused by nitrogen. Unlike the wispy shapes of the aurora, its colors are narrow and precise. Just like stars, the aurora is present during the day and the night, though during the day it is overwhelmed by the brightness of the sky. As the sun sets, it starts to become visible, being brightest near midnight when the orientation of the Earth’s magnetic field and the solar wind cause it to be strongest. The aurora is seen mostly in a ring centered roughly around the poles, where the solar wind is focused most intensely by the Earth’s magnetic field. If the Earth had no magnetic field, we’d still have an aurora, but it would be weaker and more flat across the sky: a dull glow seen in every direction. A planet like Jupiter with a stronger magnetic field has a comparably more intense aurora, while Mercury - having neither an atmosphere nor magnetic field - has no aurora at all. A terrestrial wind passing across the continents creates an unsettled display of turbulence and eddies, which we see in the form of dynamic cloud patterns, vortices, weather, and storms. In much the same way, the solar wind crossing the Earth’s magnetic field makes visible to us the turbulence of space: the vortices and eddies of magnetic fields peel off and pass rapidly overhead. Even though - like wind - the magnetic fields themselves are invisible to us, we can see it through its tracers: charged particles. As the aurora moves in the sky overhead, the ripples in it are like the wakes and eddies peeling off a boat as at travels up a rough river at night, working at times with, at time against, the current and forcing what’s there out of the way. Aurorae are caused by Earth-directed coronal mass ejections. Those ejections often come from solar flares associated with sunspots, or originate from coronal holes on the sun. The sun rotates around into an Earth-facing position roughly every 27 days, meaning that at least on a short term basis there is an element of a 27 day cycle to geoeffective emissions. 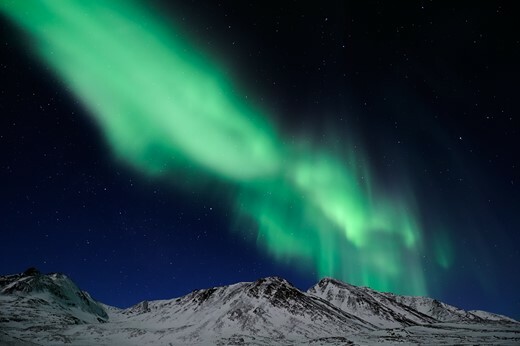 There is an annual cycle that results in disproportionately high numbers of aurorae in the weeks on either side of the spring and fall equinoxes. There is an 11-year solar cycle (the 'Schwabe cycle') during which the activity of the sun rises and falls. The number of sunspots tends to track this cycle, resulting in prevalent aurorae around the peak of this cycle. Oddly enough, though, coronal holes are most common about three years after the sunspot maximum, resulting in large numbers of aurorae also appearing about three years after the peak of the Schwabe cycle. There are also much longer solar cycles stacked on top of these shorter ones, including cycles with periods of 22 years (the 'Hale cycle'), 87 years (the 'Gleissberg cycle'), 210 years (the 'Suess cycle') and 2,300 years (the 'Hallstatt cycle'). Most of us won’t be around for more than a few of these, though, so there is little sense letting them drive our planning. The weather on Earth is another important factor. If the sky is cloudy, it doesn't matter what's going on above the cloud layer - you won't see it. In much of the arctic, the skies tend to be clearer in late winter and early spring than in fall. Ambient light is another critical issue. In the high arctic, excessive sunlight will overwhelm any aurorae during summer and the surrounding months. The moon is another source of ambient light that must be considered. A partial moon may helpfully illuminate the surrounding countryside, avoiding the “silhouette” effect common in aurora photographs. I usually prefer about a quarter to a half of a moon when I’m including landscape in a photograph and want it to be illuminated. Anything approaching a full moon, however, can make it quite difficult even to see, much less photograph, ordinary aurorae. The most informative space weather related information on the net, in my view is www.spaceweather.com. An alternative presentation of similar information is available from the Space Weather Prediction Center. Good short-term auroral predictions for Alaska are available on the University of Alaska website. iPhone and iPad applications 'LightTrac' and 'Darkness,' which provide location-based data regarding sun and moon rise/set. Further information on solar cycles is available on Wikipedia. Photographers in search of exceptional aurora imagery will generally need to travel a significant distance. This is because aurorae form in oval rings that, roughly speaking, circle the magnetic north pole (the 'aurora borealis') and magnetic south pole (the 'aurora australis'). When observed from far away, these rings will appear as a faint glow on the horizon. 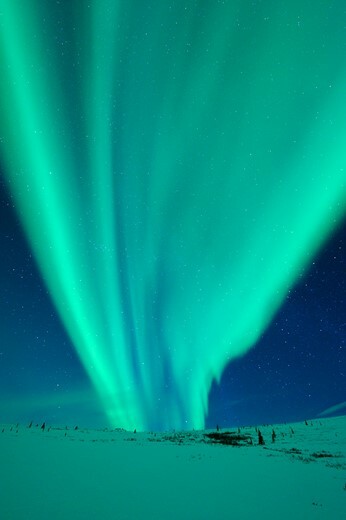 When viewed from the arctic or antarctic, however, even an ordinary aurora will often appear directly overhead. Overhead aurorae tend to be more photogenic, clearer and brighter because of reduced atmospheric interference, and will more effectively illuminate the foreground. Auroral displays over snow, for instance, will generally cause the snow to take on the coloration of the aurora. In comparison, when an aurora is low on the horizon, the foreground will often appear as a less-interesting silhouette. In addition to finding a location remote from the equator, you’ll want to situate yourself far away from city lights, airports, and other sources of light pollution. To give you a quantitative sense of what this means, when photographing around Fairbanks, Alaska (population under 100,000, counting the surrounding boroughs), I prefer to be at least 30 to 40 miles out of town. The farther, the better. Even from 100 miles into the bush, my photos will occasionally still show a faint orange glow on the horizon. Central and Northern Alaska: Relatively easy access from most of the United States, via Fairbanks. Hundreds of miles of beautiful mountain scenery, with year-round road access. The best locations, in my opinion, are along the Dalton Highway north of Coldfoot. Iceland: Astoundingly beautiful landscapes abound, and unfrozen water suitable for reflections is abundant, even in winter. Frequently overcast, but still one of the world’s most wonderful countries to visit. However, travel from most places outside of Europe can be time-consuming, and staying in Iceland can be very costly. Yellowknife, Canada: Well-situated in the auroral belt, but most photos from Yellowknife seem to feature flat fields of snow with pine forests. Greenland: At the time of writing Greenland is quite difficult to reach directly from the United States or most other countries, unless you’re a world-class swimmer. There's no road system, but Greenland is a superb place to snowshoe around in the dark, searching for aurorae. Greenland isn't for the faint of heart though - think twice before wandering around in the dark, searching for aurorae in a land filled with polar bears. Tromsø, Norway: A very long trip from North America, not even counting the time required to find the 'ø' on your computer when booking the flight. This location offers picturesque mountains and water in which auroral reflections regularly appear, but you might struggle to completely exclude the glow of town and city lights from your photographs. Antarctica: Exotic, and one of few locations where one can photograph the aurora while huddling for warmth with a colony of emperor penguins. Unfortunately, unless you’re a scientist overwintering at a research station, it’s virtually impossible to access the continent when aurora are most prevalent. As I’m based on the west coast of the United States, northern Alaska has become my preferred location for aurora photography. A camera body that excels with clean high-ISO operation. 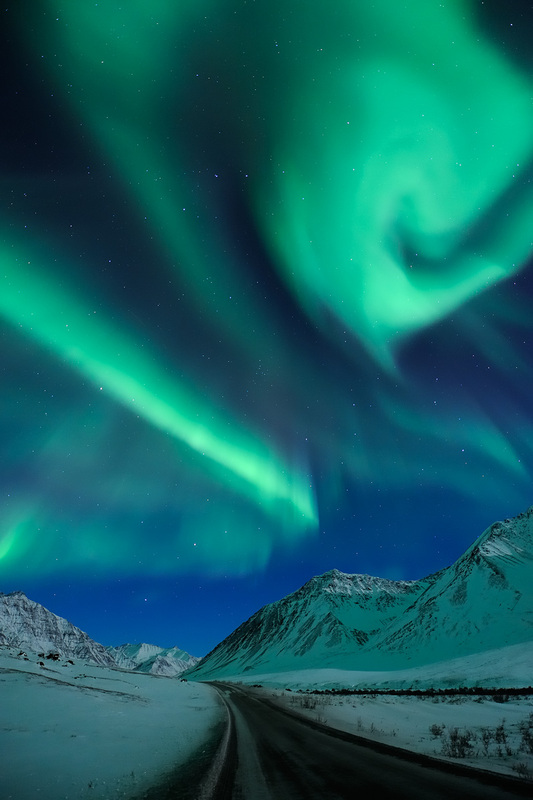 There are a number of new bodies in recent years that meet these criteria well, and which have enabled revolutionary advances in the field of aurora photography. Weather-sealing is a definite plus, although not a necessity. A wide, fast lens. On a full frame camera, a focal length of 24mm or less is desirable – but the wider, the better, in my experience. Ideally the lens will be able to shoot sharp pictures with minimal vignetting at a maximum aperture of f 2.8 or less, as you’ll want to keep your exposures short. All else being equal, your exposure will be inversely proportional to the square of your aperture, meaning that a lens at f 2.8 will need four times as long to capture an image as at f 1.4. Currently, my favorite lens for this purpose is Nikon’s AF-S Nikkor 14-24mm f 2.8G ED. A sturdy tripod, and a remote shutter release (or, at a pinch, your camera's self-timer function). Don’t bother leaving home without them. They’re essential for aurora photography. A robust ballhead is also extremely useful. Gearing up for winter photography, at night, in the arctic, necessitates psychological preparation as well. If you want to get the most out of your journey, you’ll need to be prepared to be awake and working most of the night. Aurorae just don’t seem to enjoy the warmth of the tropics or the glow of the midnight sun during summer. You’ll need to play on their home turf, during the dark months. That means planning to spend hours on end, standing around outside at night, quite possibly in extreme cold, and probably a long way from home. Clothing: be sure you’re dressed for the occasion. This is not a party you’ll want to attend in a mini-skirt. For winter aurora photography I’ve settled on a down-filled mountaineering suit (the Mountain Hardwear Absolute Zero), winter boots rated to -40 degrees F (the Sorel Caribou Reserve), multiple pairs of long thermal underwear (Under Armour ColdGear Base 3.0, both top and bottom), and a wind-proof cap (by Mountain Hardwear). For the hands, you’ll want gloves thick enough to keep you warm, but thin enough to allow you to operate your camera. Personally I prefer to forgo gloves and keep my hands in warm pockets between shots. Most of the time it works fine. If you’re averse to occasional frostbite, try a different approach. Batteries: The temperatures of the far north take an enormous toll on battery life. My camera batteries last around 1,500 actuations in normal conditions, but in the arctic winter have become exhausted after as few as 25 frames. The conventional cold weather advice is to keep your battery warm by storing it in a jacket pocket while not in use, but that is not an adequate solution under extreme arctic conditions. I recommend bringing multiple batteries and a charger, and rotating the batteries through the charging station when they’re not in use. If your aurora photography will take you far from the nearest well-stocked camera store, consider also bringing backups for any other 'mission critical' elements of your system. Tripods: Carbon fiber tripods are just wonderful. They’re light, and in cold weather can be carried without chilling your hands as much as metal would. In frigid temperatures, however, both the carbon fiber legs and the adhesive used to connect then to your tripod base can become brittle. Exerting substantial pressure on your tripod, particularly when its legs are buried in deep snow, can easily result in the amputation of a leg. If you’d prefer not to find yourself hundreds of miles from civilization, with only a 'dipod' for support, be particularly cautious when planting your gear in deep snow. Cameras and lenses: As noted above, weather-sealing is preferable. In part, this is to help prevent condensation from forming inside your equipment, when you move from an exceptionally cold environment (e.g., shooting outside) to a much warmer space (e.g., into a heated car). Particularly for non-weather-sealed equipment, including most medium format cameras and lenses, it is essential that the cold-to-warm transition be made gradually. It only takes one misstep to generate trip-ending amounts of condensation inside your lenses or sensor. To help slow the transition, I transfer my equipment to a camera bag that has also been outside, and only after sealing the bag do I move the bag and its contents into a warmer space. The camera is then allowed to heat up, slowly and safely, within the bag. For even better protection, consider placing your equipment in an airtight enclosure, such as a Ziploc bag, during the thawing process. Safety gear: If you’re headed to the far north during winter you should, of course, also read up on how to travel safely in cold, icy climates. When travelling in northern Alaska between November and March, I’ll usually bring extra fuel, chemical additives to prevent the fuel from freezing, an oversupply of food (including food that will be palatable when frozen), a cold weather sleeping bag (rated to -25 degrees F), jumper cables and a tow rope with which a vehicle could be rescued after sliding off of an icy road. My tow rope has paid for itself on multiple occasions. Thank you for the awesome article! I live in Alaska and have been trying to get that "WOW" aurora photo, but haven't quite nailed it yet. I'm shooting with a Canon 5D Mark II, and generally with my 16-35mm F2.8L lens. The issue I usually have is a significantly underexposed foreground, and properly exposed (at least it appears that way) aurora and sky. Do you have any advice for me? I try to stay in the ISO 1000 range, and shutter speed of 5-20 seconds, and rarely go over 30 seconds, as the auroras seem to smear and the stars begin to create trails. Thank you again for the article! The season to shoot the lights is back upon us here in Alaska, and I'm excited to hopefully get some good shots this year! Hey Dan, sorry for the delay in responding to your question. The short answer is that's not going to be an ideal camera for multiple reasons -- primarily that it has a relatively small sensor and thus suboptimal high ISO performance, and secondarily that (assuming you're going to the arctic where the aurora will hopefully occupy a large part of the sky) the lens isn't going to give you as wide a field of view as you'll probably want. You'd certainly be better off with a full frame sensor and a wide angle lens that let in more light. That said, if your expectations aren't too high then you could definitely have some fun with the Canon and if the conditions are right, return with some nice shots. On your second question, it appears that Canon has an app that allows your smartphone to work as a remote but I've never tried it. Good luck! Great article and a question - I'm planning to use my Canon PowerShoot G1X Mark II, do you believe it would lead to a reasonable results ? Also, any recommendations for remote control. Excellent photos and great article. Thanks. I'm planning a trip to Nome in May. Probably too far south and too late in the season, but I'll use this to prepare, just in case I get lucky. gerritgroot: the subject of camera settings is addressed on page 2 of the article, in section 6. Had you read the full article before commenting, you would have learned (i) what ranges of settings are recommended as a starting point, and (ii) that optimal settings depend on factors including the strength of the particular aurora you are photographing, such that EXIF data from images of aurorae you did not photograph would be "pretty useless." There're no EXIF data in the pictures. This makes the whole article pretty useless. One of the most thorough Aurora articles I've read. Nicely done. Hope to plan a trip in 2013. I am off to Lapland in about 6 weeks time in search of the Northern Lights. I know it is pure chance if we manage to see them but it would be superb if we did. I have been practicing my "manual mode" skills and have just purchased a 14mm lens to attach to my E-PL1 in the hope of catching some decent enough pics. Great article and some really good tips. Thanks. Thanks for a very informative and enjoyable read. I live in Southern Ontario and travel to see family across Nrothern Ontario where I have had the good fortune to see the Aurora Borialis many times. I have never thuoght about photographing them, I will be sure to give it a go. Your landscape tips look like good advise. Oddly enought the times I have seen them have always been during the summer months, although judging from your pictures they look to be more intense than any I have seen in July. Thanks for the nice article. If only all Dpreview articles were of this quality. I do quite a bit of celestial photography here in high latitudes and my recommendation is an aluminum tripod with foam covered legs. I also refuse to leave home without a thermos flask full of hot drink. Thanks for the very informative article and inspiring photos. 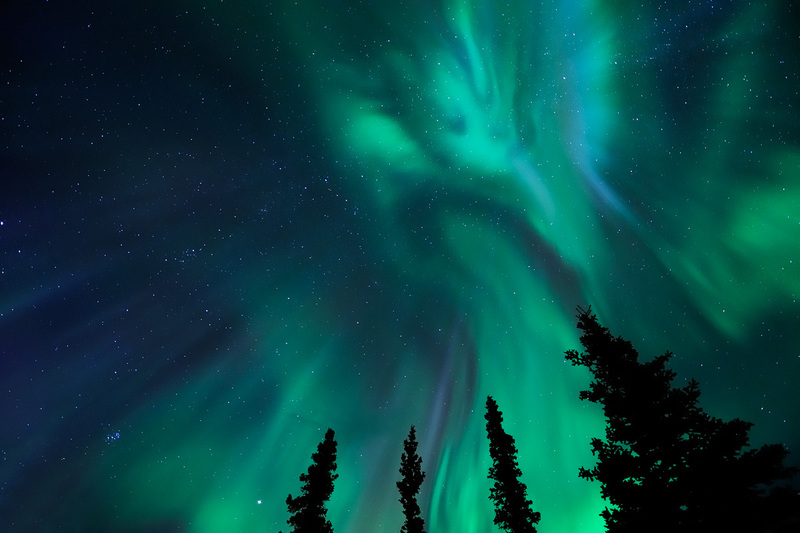 I plan to travel to Fairbanks, Alaska in March of next year to try to capture some of my own Aurora shots. I really look forward to skies without light pollution also. Something I haven't seen since I was a child, living on a farm in central Washington (state). Very good article and detailed. Thanks for sharing! thanks for sharing your experience and expertise. I was wondering if you could provide us with details on "Astral photography" too. Also, though this article sounds great, but I think I won't be able to actually execute it since I'm based in India, and there's no info. about my country herein, as to examples of favourable places. Great to share with every photographer who appreciates space/ nature photography! Best of Wishes always! An excellent read, I must say this is the kind of article I've been looking for for a long time. Excellent article, the best I read here so far! Boorrris- you raise a good question about the 24 f/1.4. I have both that lens and the 14-24, but strongly prefer the 14-24 when I'm in a location with arourae regularly appearing overhead (such as Iceland, where you're going). If you want to include some foreground as well as a large portion of the sky, a 14mm field of view makes an enormous difference -- one that more than compensates for its narrower aperture, in my opinion. When the aurora can be seen significantly south of the arctic (e.g., in Minnesota, or even Mexico, where it reportedly appeared in 1859! ), it will more often be hovering near the horizon. In those situations, a 24mm view may work better from a compositional perspective and the wider aperature of the prime would be a plus. Images of the Northern Lights have always captivated me. Even with no chance of ever experiencing or photographing them I very much enjoyed your well written article. And the photos .... WOW! Thanks so much for the best I've ever seen! 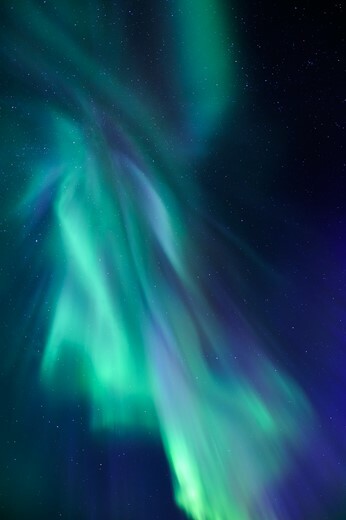 very nice auroral photos. I realy want to go to north to having looks. I plan to go to Iceland near next Spring Equinoxe and hope to see some aurora. I need a fast wide lens. The article cites the Nikkor 14-24 f/2.8. Has anyone tried the new 24 f/1.4 for aurora photography ? You don't have to go so far. Northern Minnesota, western Ontario and Manitoba are straight south of the magnetic north pole. I've gotten excellent northern lights photos off the deck of my house in the "bush" near Orr, MN, where there are few people and few lights. For equipment, a manual Olympus OM-1 with a 21mm f2 Zuiko does the trick. No batteries to worry about in the 40 below weather. It always works. No muss, no fuss, and cheap. Having no indoor toilet and having to go to the outhouse is a great aid in getting northern lights shots. It gets you outside at night. By the way, Highway 11 along the south side of the Rainy River is called the Under the Dancing Sky Highway in honor of the northern lights. I do not travel with a car to warm batteries. My photo safaris consist of being outdoors for days at a time. I hit a pocket of air south of Yellowknife that went below the lowest capability of my thermometer (-50C). My camera batteries stopped working and it was a beautiful clear evening due to the cold temperatures. I have not come up with a battery solution. The only thing I can think of is wiring up some kind of contraption to make the camera use disposable lithium batteries (which work in cold temperatures). Yes you can store batteries in a vest under your jacket but at -40 they freeze the instant you put them in the camera. I live in Interior of Alaska and we get cold temps on a regular basis often 58 below zero. what I do is get those toe warmers from the store the ones that have the sticky backing and attach them to the outside of the camera housing where the battery is located! I have never had a problem since doing this many many Alaskans who shoot photography use this same trick. Well written article, very informative. Working in the Canadian north I've seen them frequently. Keeping the camera warm is an issue. I've had batteries die forever at -40C. Sadly most people never even see a real night sky, it is spectacular! A small but thick polystyrene box with warm packs will keep the camera warm until you see the aurora, better than the humid inside of your parka. A quick release head is essential, one you can operate with gloves. Fleece liner with winter mit works well. Few Canadians have northern clothing! If you can't borrow the right stuff it gets very expensive. -100F boots are a real joy! ... oh, now i see where the better comments are ... why are there 2 'comments' sections though? For DX Kits, the single best len out of there is for sure the tokina 11-16 F/2.8 by far. It's very sharp even wide-open, the vignetting is a problem only at 11-12, but you can easy correct it after; and the corner sharpness isn't a big deal in the night with a moving target. For long exposure the difference between F/2.8 Vs F/4 is huge, it cost you 10-15 secs (you really want keep the time under 15 sec) or a step up from at least 800-1600 ISO with more noise less dynamic range. Canadian aurora borialis photographer Zoltan Kenwell has taken some excellent images. He has recently posted some time lapse video which is very interesting as well as some shots with purple auroras. All his shots are taken outside of Edmonton, Alberta. It shows that you do not need to go that far north to obtain these images!!! An excellent article; and some really great shots too Ben! I'd add a sachet or two of silica gel to the warming-up-bag to further reduce the risk of condensation. I'd also make sure that people remember to get the camera out of the bag eventually. If there's moisture and you're in the warm, your camera lens is at risk of fungal attack if you leave it in there for a few days. Getting it cleaned will be expensive. Thanks for the article and posted examples! Nice reading and even nicer watching. Awesome and I envy people seeing personally this magnificent display of nature. I not plan to shoot auroras but I enjoyed very much to read the article. Thank you so much for such an informative article with absolutely stunning shots. Not only was the article great for capture of Aurora shots but for me it contained some very valuable info on cold weather photography. Judging by the winter weather predictions for this year for where I live that info will be vital. It will be either stay inside and keep your camera equipment and self warm or get out and catch some great cold weather shots. Very good & informative article. Thanks! One potential problem I didn't see mentioned was frost build up on your lens. Here in Southeast Alaska we seldom have arid, cold weather - there always seems to be some moisture in the air. When out for hours photographing auroras, frost can eventually build up on the surface of the lens. It pays to keep checking for this. 5 tips to help avoid the problem are 1) keep your lens covered when not shooting, 2) strap chemical hand warmers to the lens barre to keep it warm, 3) keep the lens pointed downwards when not shooting, 4) don't exhale near/towards the lens and 5) use a lens shade. About exposure time and ISO. I prefer 1-5 seconds exposure to catch the "fibres of light". The higher ISO and noise are in my opinion worth it. If the intensity is low its not possible and you have to opt for the second best. A fast lens and camera with good high ISO is always helping. Both space weather and earth weather have to be good to take aurora photos. A couple of weeks dosent garantee you a match, but i think two weeks give you good chances (80%?). About the location Tromsø, Norway. The city lights are easy to eliminate. Just leave the city and enyoy the dramatic costal landscape. The weather tends to vary a lot along the cost, so you should plan on spending some time to get the most out of the stay. Northern Sweeden and Finland offers a better weather, but far less dramatic landscape. Mostly flat and foresty. The northern Norwegian coastline has lots and lots of fjords surrounded by 1000m peeks. Nearby sites worth checking out is Ersfjorden, Lyngen, Senja, Andøya, Vesterålen and Lofoten. Google theese names + aurora. The temperatures is usually not below -10 C near the coast, but it can be quite windy so bring a sturty tripod and warm clothes. 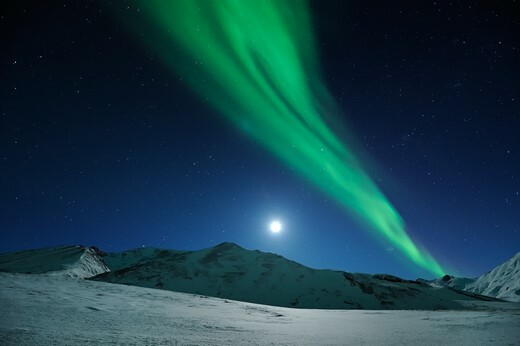 The "skinny": To see auroras, one must go to the Arctic regions in midwinter darkness, have a clear sky on a frigid night, go 30-40 miles away from any city lights, and preferrably pick a year that fits one of the solar cycles (every 22, 87, or 210 years). To photograph them, you better keep the batteries warm and not freeze your own fingers or nose, either. I'd truly wonder how you could photograph the auroras with a full moon in the frame. Do montage and layering help? I presume that most of the shots involve some enhancement relative to what the naked eye actually sees. This also happens with astronomical or microsopic imaging, but the boundary between nature photography and painting may be a dim swath of of green. Where are the red, purple, or violet aurorae? The samples are all emerald. No multi-color "shows" on a given night? Is it necessary to pick another season or year? Other colors appear mosty when its intense. Its when the solar wind reaches deeper in the atmosphere and exites other gases then those in the uppermost atmosphere. Colors can appear and disappear. Theese color briefs can last from seconds to hours. Most of the time its just emarald. When its intense, you can have the moon in the frame without over exposing. But i like to shoot a different direction and get aurora pictures with moonlit landscape. Slight correction: The shortest solar cycle is 11, not 22 years. Also, there isn't any "pre-known" top year. The top of the solar cycle can (and usually does) last for several years. Indeed, most of the time the naked eye does not see the colors that the camera does - it needs a certain intensity of light to be able to identify colors. So most of the aurora in these shots would actually look pale white with a hint of green, but when the aurora gets really bright (and especially if it's overhead) you do get to see the colors. Also, the colors actually do depend on season and time of night. Magenta lower borders occur mostly in evening and around midnight. They are hard to capture because they come in brief and bright bursts, and you'll have to dial down the exposure quickly and just right not to overexpose and wash out the magenta. Often you also get a different color at the top of curtains - red or blue. If the sun is shining at the altitude of the curtain tops (close to sunset/sunrise) it will be blue. If it's solidly in Earth's shadow it will be red, and during transition you can get a beautiful mix of blue and red. Possibly the best photographic article on DPR so far, very comprehensive and full of stunning pictures, many thanks! Just curious why namely the Tromsø is included, when you can capture that in so many locations in Norway (well, in Sweden, Finland or Russia too!) and there are better places even in Norway (possibly not in Troms but Finnmark county, which is the nothernmost part of Norway). Wondering if the reason is airport in Tromsø? I guess its the airport. Its the largest airline hub in the area, and not nearly as expensive as tickets to I.E. Båtsfjord. Its also the larges city in the area with lots of photo enthusiasts spreading aurora pictures on the net. Me being one of them. Thus, probably the most known aurora place in the region, according to photo count on the internet. Its worth noting the that the dramatic landscape along the whole coastline from Kirkenes to Bodø could enhance aurora photos. Tromsø and Troms County has ice free fjords, majestic mountains, valleys and great access to different locations in Northern Norway. Within 2 hours drive you can go to Finland or other locations. Check out http://nng.no and come and see. Less than 2 hours flight from Oslo and 40GBP/80USD one way. I know Troms and Finnmark counties (and many more in Norway) quite well as I am going there almost each year (by car, a much better option than the plane!). This was exactly the reason I was asking why namely Tromsø is listed. Thanks for crisp and clear information. And for maintaining a tinge of well-intended humor. Awesome article, and great information, I will be going to Iceland at xmas time, so hopefully I can remember (to bookmark this page at least) and I can capture something remotely close to the great pictures you've displayed here. Thanks for sharing your not so easily attainable experience and knowledge. Nice reading, unusual photos. Brilliant post. The person who doubts the description of the science behind aurora in this article ought to examine his own understanding.